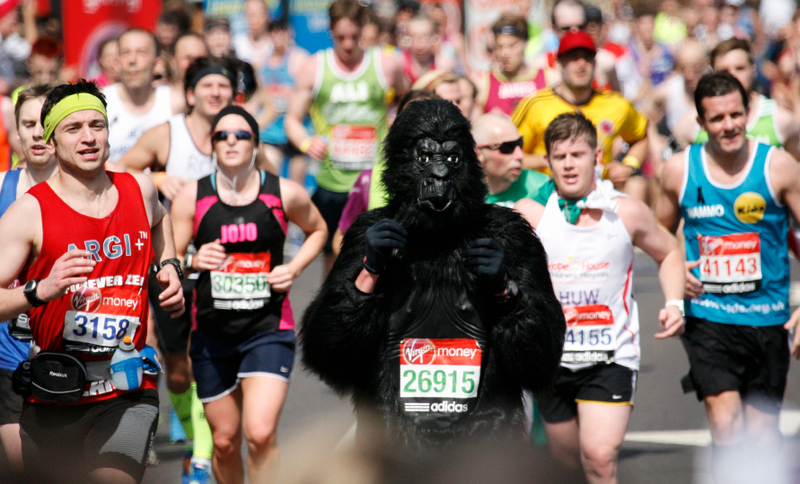 The 34th London Marathon will be run on 13 April 2014, and is one of the world’s leading athletics events. The London Marathon attracts world and Olympic champions, as well as range of amateur runners of all abilities. The festive atmosphere often features playful runners dressed up for charity. Although the current London Marathon was first run on 29 March 1981, long-distance races have been held in the city as early as 1909. In that year, the Polytechnic Marathon was organised for the first time. The last Polytechnic Marathon was run in 1996. The prestigious London Marathon is held each year in the spring. Founded by former Olympian Chris Brasher and John Disley, the London Marathon is one of the top six international marathons recognised by the International Association of Athletics Federations (IAAF) in addition to New York, Boston, Tokyo, Berlin and Chicago. The London Marathon features three groups of starters: Elite Women, Elite Men, and Wheelchair (men and women). These starter groups are followed by a Mass Race with runners of various abilities. The first edition of the London Marathon attracted 6,747 runners. In 2013, the event attracted 34,631 participants. The route for the London Marathon is largely flat and concentrated around the River Thames. It has changed very little over the years, with changes primarily being made as a result of construction and road works. The race begins at three different points around Blackheath. The often fast-paced marathon ends at The Mall, next to St. James’s Park and close to Buckingham Palace. The course spans 42.195 kilometres, or 26 miles and 385 yards. Beginning at Blackheath, the London Marathon travels south of the River Thames and east towards Charlton. The three separate starting points merge after 4.5 kilometres (2.8 miles) near the Royal Artillery Barracks in Woolwich. From there, runners travel past the Old Royal Naval College before heading to the Cutty Sark in Greenwich. The course then winds towards Surrey Quays at the Docklands, followed by Bermondsey. After running along Jamaica Road, competitors reach the half-way point of the marathon at Tower Bridge. From Tower Bridge, runners head east along The Highway and onward through Wapping before venturing towards Limehouse and Mudchute in the Isle of Dogs. The marathon travels then to Canary Wharf, where the route continues to make its way to Poplar and back to Limehouse. Once back on The Highway, runners make their way along Lower and Upper Thames Streets. The last leg of the marathon takes participants to The Tower of London and along The Embankment, which offers the London Eye as a scenic backdrop. From the Birdcage Walk, competitors run past The Queen Elizabeth II Tower (Big Ben) and Buckingham Palace before crossing the finish line on The Mall. Since 2010, the London Marathon has been sponsored by Virgin Money. As such, the event is formally known as the Virgin Money London Marathon. Previous title sponsors have included Gillette, Mars, ADT, NutraSweet and Flora. Several other companies also serve as secondary sponsors, including Adidas, Lucozade Sport, Timex, TNT, Renault, Buxton, Holiday Inn, BBC, realbuzz.com and London Pride in 2014. Charities play a significant role in the London Marathon, which has helped raise over £600 million for charities since 1981. Virgin Money Giving is the official fundraising site for the event, allowing individuals and corporate teams to raise money if they are participating in the event. For every £10 raised, charities receive £12.15. Businesses and corporate donors can support a charity directly or encourage employees to participate as part of charity teams participating in the marathon. Businesses can support the London Marathon in a number of ways. For more information on sponsorship and ways to support the London Marathon, including how to donate to participating charities and runners, visit www.virginmoneylondonmarathon.com. ← Is it Faster to Walk Between Some London Underground Stations than Take the Tube?